America is more unequal than it has been in a century. The richest 0.1 percent of American families own as much wealth as the lower 90 percent of all American families combined. Between 1979 and 2007, the richest one percent took in 53.9 percent of all income growth. And wealth inequality grew even more dramatic in the wake of the great recession. The richest 7 percent expanded their average neat worth by more than 25 percent between 2009 and 2011, and whites claimed an even larger proportion of American wealth relative to Blacks and Hispanics. Americans have responded with anger and indignation. The Tea Party Protests of 2009, Occupy Wall Street in 2011, and the campaigns of Donald Trump and Bernie Sanders were each, to some degree, directed at the growing concentration of wealth and power in the hands of the few. A majority of Americans – 65 percent – say that the economy unfairly favors powerful interests. Some 63 percent say that money should be more evenly distributed throughout the economy. This growing inequality conflicts with many of America’s founding ideals. So too does the failure by both major political parties to support strong actions to combat the concentration of wealth and power in the hands of the few. From the founders’ efforts to abolish the practice of leaving all of a family’s wealth to the first-born male, to Head Start in the 1960s, Americans have repeatedly used government action to deconcentrate wealth and to promote equality of opportunity. Antimonopoly efforts were closely tied to America’s founders’ belief that true democracy required that all citizens enjoy some degree of “independence.” Such independence in turn required that citizens own and work their own property, and not depend for their livelihood on the whim of some powerful boss or landlord. Writing in 1792, Madison argued that neither property nor a just government is secure if “arbitrary restrictions, exemptions, and monopolies deny to part of its citizens,” their right to own, acquire, or use their property. In the case of land, this led the founders to use government to promote widespread access to parcels large enough to support a family. In the case of property in the form of manufactured goods, ideas, and labor, it meant using government to keep markets free from monopolization. At the dawn of the country, the beneficiaries of these policies were primarily white, landed men. Efforts to expand access to land were enacted at the great expense of Native Americans, and the reality that many founders were slave-owners cast a pall on their aspirations of broad-based equality. But the vision at the heart of antimonopoly — that citizens deserve equal opportunity and access to open, competitive markets, and that monopolists erode democracy by fueling unequal dependency – holds up in today’s far more progressive society. For most of the 19th century, Americans were able to use their state legislatures and local governments to break or control most monopolies. But following the Civil War, the revolutionary rise of two new technologies – the railroad and the telegraph – enabled monopolists to escape the oversight of state governments. Americans responded by federalizing antimonopoly policy, first with the Interstate Commerce Act of 1887 then with the Sherman Antitrust Act of 1890. And here too they made clear that their main goal was to make the country more equal. 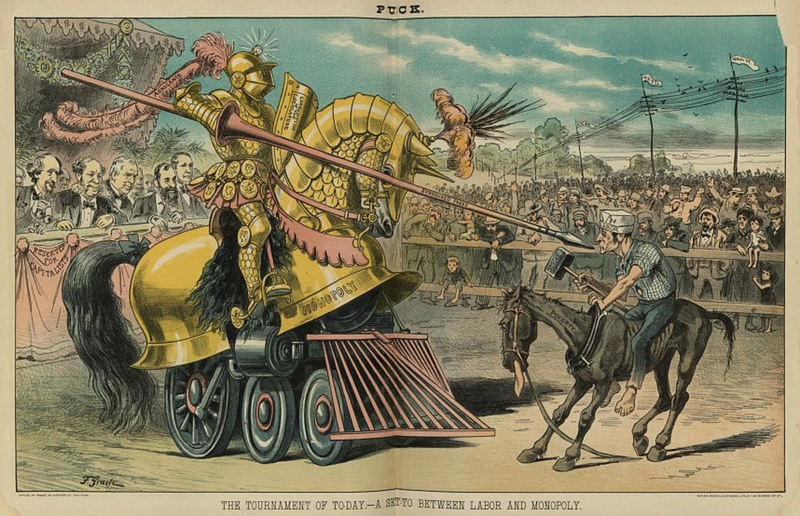 Monopoly was enough of a topic of political debate that anti-monopoly efforts even made their way into Puck, a humor magazine. Many factors contribute to today’s rising inequality. The decline of unions, the offshoring of work, the rise of winner-take-all-economies in music, sports, film, and many other fields, as well as more stringent patent and copyright rules all play a role. But in the United States, one of the main factors behind soaring inequality is also the weakening of our country’s antimonopoly policy beginning in the 1970s. The rapid rise in monopolization over the last generation has increased inequality in several ways. Monopolization means the powerful can charge citizens more for such basic goods as health care, housing, and travel. “In concrete terms, monopoly pricing on goods and services, in general, turns the disposable income of the many into capital gains, dividends, and executive compensation for the few,” write Lina Khan and Sandeep Vaheesan in a forthcoming article in the Harvard Law and Policy Review. Monopolization also means that the people who control corporations can pay workers less, knowing workers have fewer places to sell their labor. Furthermore monopoly, like most forms of concentrated power, is often brought to bear against the least advantaged in an unequal society. Monopolistic meatpackers and farm operators subject their slaughterhouse workers, who are predominantly people of color, and their farm workers, who are predominantly immigrants, to exploitative labor conditions and stop them from forming unions to achieve better treatment. Consolidation in the economy has been at the root of America’s poor job economy, under which minority Americans experience disproportionately high rates of unemployment. Monopoly, like the inequality it spurs, aggravates existing disparities. One of the easiest ways to see monopoly’s effect on America’s unequal, concentrated economy is to look at the history of retail business in America in the 20th century. Beginning with state and local laws in the 1920s and continuing with federal legislation passed in the 1930s, Americans crafted an anti-chain store policy that ensured independent business owners would control retail trade. Sam Walton was a beneficiary of that system. In 1950, he bought one of the three variety stores in Bentonville, Arkansas and opened Walton’s 5&10 on the downtown square of the small, rural town. That Bentonville supported three such stores, and other small, independent businesses, was not unusual for small towns in the United States during that time. Walton, like so many thousands of other Americans, then was able to carve out this own slice of the American Dream when he opened his own businesses. But, radical changes in antimonopoly law and policy in the late 1970s and early 1980s eliminated almost all the traditional constraints on chain stores. In the years since, a few corporations – led by Walmart – steadily took over the American retail market. Today, Walmart controls 72 percent of all warehouse clubs and super centers in the US, and in nearly 40 metro areas, the firm claims at least 50 percent of all grocery spending. Walmart today runs 5,229 stores across the United States, the equivalent of many tens of thousands of 1950s-era stores. In short, Walmart captures wealth that was once distributed among many tens of thousands of families, taking it out of areas that once benefitted from small business economies that fueled civic engagement and gave back to local communities. And indeed, the Walton family now controls as much wealth as does the bottom 43 percent of the country combined, or, as much as wealth as 137 million Americans. Now Walmart is being eclipsed by an even larger threat to open markets and equal opportunity: the rise of so-called platform monopolies, firms which own and control markets at every level. Amazon, for one, dominates evermore retail sectors, but it also competes against suppliers and customers, all the while operating the digital platform that other sellers must depend on. For instance, Amazon publishes, markets, sells, and delivers its own books, and it runs the entire system that publishers must use to market, sell, and deliver books, meaning Amazon can pressure suppliers and competitors at all levels of the market. And, Amazon’s power grows even larger when combined with the massive amounts of data that it collects. In other words, Amazon – like other platform monopolies such as Facebook and Uber – not only exercises huge amounts of monopoly power in the market; it increasingly is, itself, the market in which other businesses must compete. This new monopoly power will allow business owners to concentrate wealth to a greater degree and further damage the prospects and livelihoods of those who most acutely experience the effects of an already unequal society. Members of the Open Markets Program have been writing on this crucial relationship between monopoly and inequality for many years. In 2010, we reported that monopoly is a central cause of America’s consistently weak job economy. In 2014, we were the first to explore the explicit link between the antitrust revolution and inequality in an article in the Washington Post. Since then, we’ve highlighted the link between monopoly and regional inequality in stories about the nation as a whole and about the individual communities that have been devastated by today’s monopolists.